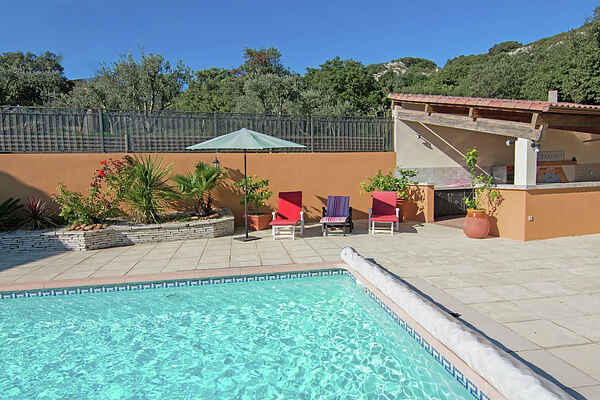 Great holiday home near the village of Lédenon and close to the well known cities of the Provence, Nîmes (20km) and Avignon (30km). The biggest eye catcher is the fenced in heated private pool with a nice outdoor kitchen. This pool is accessible via an outside staircase. The children can entertain themselves with a game of table football and table tennis. You can enjoy a relaxing game of jeu-de-boules on your very own jeu-de-boules pitch. The driveway of the estate is shared with the friendly owner. The only place where there may be some eye contact is at the pool. This region is a must for culture lovers. You will be at Pont du Gard (10 km), one of the most impressive Roman monuments of the south of France, within 10 minutes. You can convince the children to come along, with the prospect that they will be able to swim as well as canoe at this bridge. For more masterpieces you can go to the charming city of Nîmes. Very much worth seeing as well, is the Papal palace in Avignon. For a day at the beach you can head to Le Grau-du-Roi (60 km) and Stes. Maries-de-la-Mer (80 km).